There have been post-marketing reports of hypersensitivity and anaphylaxis associated with use of acetaminophen. Clinical signs included swelling of the face, mouth, and throat, respiratory distress, urticaria, rash, pruritus, and vomiting. There were infrequent reports of life-threatening anaphylaxis requiring emergency medical attention. Instruct patients to discontinue Acetaminophen and Codeine Phosphate Tablets, USP immediately and seek medical care if they experience these symptoms. Do not prescribe Acetaminophen and Codeine Phosphate Tablets, USP for patients with acetaminophen allergy. In the presence of head injury or other intracranial lesions, the respiratory depressant effects of codeine and other narcotics may be markedly enhanced, as well as their capacity for elevating cerebrospinal fluid pressure. Narcotics also produce other CNS depressant effects such as drowsiness, that may further obscure the clinical course of the patients with head injuries. Some individuals may be ultra-rapid metabolizers due to a specific CYP2D6*2x2 genotype. These individuals convert codeine into its active metabolite, morphine, more rapidly and completely than other people. This rapid conversion results in higher-than-expected serum morphine levels. Even at labeled dosage regimens, individuals who are ultra-rapid metabolizers may experience overdose symptoms such as extreme sleepiness, confusion, or shallow breathing. The prevalence of this CYP2D6 phenotype varies widely and has been estimated at 0.5 to 1% in Chinese and Japanese, 0.5 to 1% in Hispanics, 1â€“10% in Caucasians, 3% in African Americans, and 16â€“28% in North Africans, Ethiopians and Arabs. Data is not available for other ethnic groups. Do not take Acetaminophen and Codeine Phosphate Tablets, USP if you are allergic to any of its ingredients. The risk of infant exposure to codeine and morphine through breast milk should be weighed against the benefits of breastfeeding for both the mother and baby. Caution should be exercised when codeine is administered to a nursing woman. 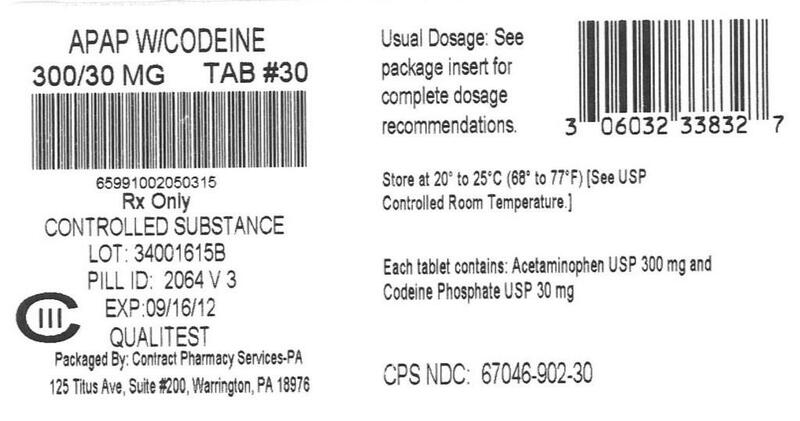 If a codeine-containing product is selected, the lowest dose should be prescribed for the shortest period of time to achieve the desired clinical effect. Mothers using codeine should be informed about when to seek immediate medical care and how to identify the signs and symptoms of neonatal toxicity, such as drowsiness or sedation, difficulty breastfeeding, breathing difficulties, and decreased tone, in their baby. Nursing mothers who are ultra-rapid metabolizers may also experience overdose symptoms such as extreme sleepiness, confusion, or shallow breathing. Prescribers should closely monitor mother-infant pairs and notify treating pediatricians about the use of codeine during breastfeeding (see PRECAUTIONS - General - Ultra-Rapid Metabolizers of Codeine). Acetaminophen and Codeine Phosphate Tablets 300 mg/30 mg are white, round, flat-faced, beveled edge, scored (bisect bar) tablets, debossed "2064" and "V" on one side and debossed "3" on the reverse side. They are supplied in bottles of 30, 50, 60, 90, 100, 120, 180, 500 and 1000. Acetaminophen and Codeine Phosphate Tablets 300 mg/60 mg are white, round, flat-faced, beveled edge, scored (bisect bar) tablets, debossed "2065" and "V" on one side and debossed "4" on the reverse side. They are supplied in bottles of 100, 500 and 1000.